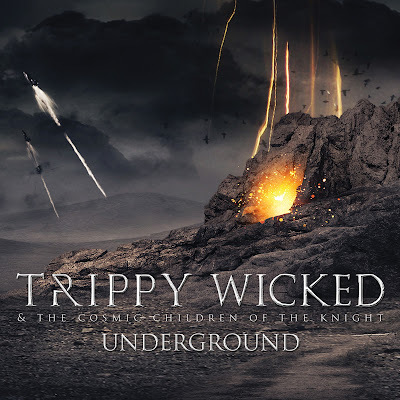 Trippy Wicked and the Cosmic Children of the Knight return after carving a deep groove in the UK heavy music scene with their previous releases, several of which have gained great reviews on Heavy Planet with these 3 lads from St Albans being firm favorites of most of us here, qualifying them to be featured in Nuclear Dog's and Toby's top 20 albums of 2012. I first discovered Trippy Wicked back in 2010 whilst living near a beach and their song "Sandbag" from their first album was the soundtrack to my time there as it seemed somehow appropriate. "Moving On" was on heavy rotation back then and whenever I listen to that album now I am transported back to those times of beers, toking and beach fires, salty hair, sandy eyes, extreme wind and sea water filling the streets of the small seaside village in which I lived. I have loved Trippy Wicked ever since those gusty, salty days and have followed their career with much interest and have made sure to make a long trip to hear them play live a couple of times, one of which was on their stop at my home town on their recent UK tour to promote this latest offering from one of the most interesting and entertaining heavy bands in the UK. Trippy Wicked just ooze character and their riffmanship is some of the very best I have heard in all my years of being a lover of low end heavy grooves; their riffs, their lyrics, their cheerfully bluesy swagger and cheesy stage smiles are very appealing to those of us who appreciate those crushing moments in classic riffcraft which Trippy Wicked possess by the rum barrel load. So it was with much joy in my heart when I discovered that the Trippy Wicked dudes had been busy in the studio crafting an EP of 5 songs which I think are some of the best they have released yet. Trippy Wicked just keep getting better with every release and although this EP sees a much sludgier twist to their sound, this is still very much Trippy Wicked through and through. The opening title track "Underground" has TW blast forth into a churning and thick fuzzed riff momentum which has all the hallmarks of a classic TW track. It holds a melancholy that is not often heard in a TW song but nonetheless has great uplifting moments that show, altough TW have turned their hands to the darker side with this EP compared to their last album, underneath the desperate, almost hopeless tone, an ode to a dying world, there still lies a cause for celebration, even if the ticking clock that ends this song tells us our time is fast running out. The tick tocks lead to the chunky bass plucks of "Echoes Return" which in my opinion is one of TW's best songs so far. With an almost emotional sludge tinge this song is quite far removed from the typical TW sound, but it still has TW written all over it. This is TW taking their solid low end groove to new dimensions and it is a welcome departure from some of the booze drenched hoedowns of their last album "Going Home." This is a song that plucks the heavy heart strings leaving heavy riffs, drums and vocals that are mezmerizing in their mouth watering execution. "Enlightenment" has TW exploring the psychedelic realms with an intro that brings to mind the transcendental repetitivity of OM. Then TW turns the super heavy fuzzy sludge riffs to maximum creating a spirit raising groove that runs waves of sonically eargasmic energy into the lug holes and then up and down the spine causing white hot flashes of intense bright light to flash before your inner eye. "Discoveries" launches straight into a plodding fat fuzzed riff and driving drums that could almost be a continuation of the previous song. This track is I think TW's first instrumental put to record and with such brilliant riff work on display this is a track that speaks for itself. The song ends beautifully and could be a song in itself but I wont give any spoilers as to what TW do here. "New Beginnings" ends this EP and tells the story of a defeated human race finding solace underground due to a dead sun and a scorched earth but despite the tragic tone there is hope that lies therein with a statement that we can live as one. Out of chaos comes opportunity and through the crushing sludgy riffs that TW put their hands to on this song there is a distinct glint of determined hope that shines through with the unforgettable and passionately sung vocals of Pete that gives this track the unmistakable stamp of Trippy Wicked and the Cosmic Children of the Knight. As I have already mentioned above, I recently saw Trippy Wicked play my home town when they stopped there on their latest tour. Supported by Bright Curse and Wight, (who totally blew me away), TW took to the stage with a hyped up crowd craving for more bone shaking heavy riffs and none in attendance were disappointed. Joined by Tony Reed of Moss Generator on drums and TW's usual skin basher Chris West on bass duties for the tour, TW tore through a blistering set of old and new songs, big grins and gurning faces aplenty and a very appreciative crowd lapping up every crushing riff and explosive drum smack. TW played a solid set with lead man Pete's impeccable singing sending shivers up the spines of all who were lucky enough to witness such a blinding set from the fast rising stars of the UK heavy music scene. To any of our Brit readers; I highly recommened you catch Trippy Wicked live if they swing by your town or city as TW sound as great live as they do on record. To our American friends; I'm sure it is only a matter of time before TW travel across the Atlantic to grace your shores with their unique and highly enjoyable blend of good time blues rocking drinking songs, super heavy and memorable riffs, solid song construction and cheesy twisted grins, beards and beer and a guaranteed great time that will not be easily forgotten. "Underground" will be released on Trippy Wicked's own imprint, Superhot Records on September 13th but can be preordered now at their Bandcamp where 2 songs from this truly great EP can be previewed for your heavy listening pleasure. I can't to hear the new songs on the album. Better than ever cool stuff. It is a very cool album. The album is a great one. Thanks for sharing. It was nice to hear the tracks. I really like rock. Trippy Wicked are the best! makes me feel the life.. in bad or good moments. If you love real music then i do say that you listen to this one! freakin awesome!